The first advisable rule for making an album grab a listener’s attention is to toss in a memorable opening track. 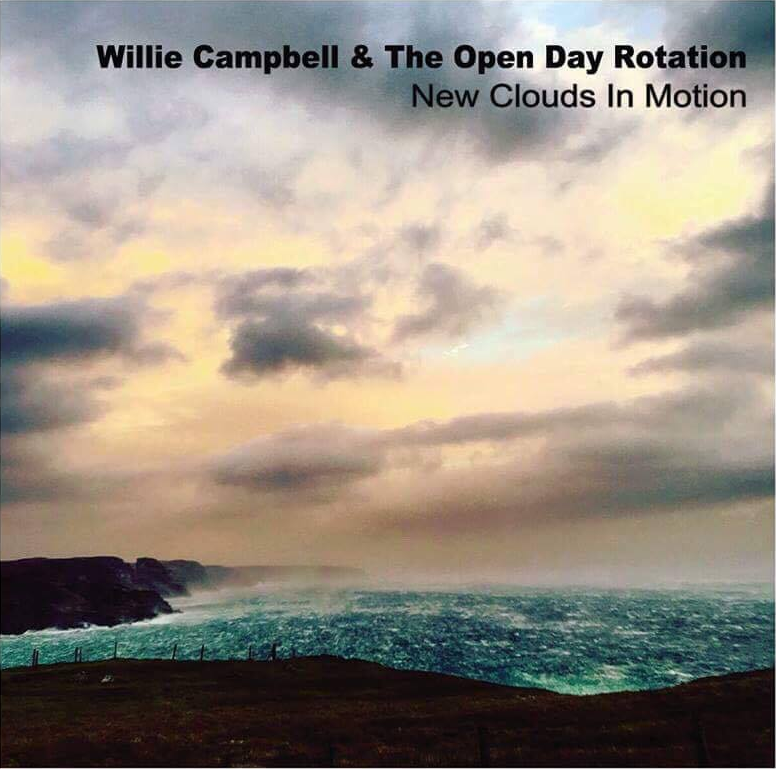 Obviously, this needs to be followed up with the remainder of the content being of a similar quality; a feat that has been achieved with the brand new album from Scottish –based singer-songwriter Willie Campbell. Along with the assembled ensemble billed as The Open Day Rotation, this artist -more specifically from the Outer Hebrides- has produced an extremely engaging and accessible album that never veers off a high plane highway. NEW CLOUDS IN MOTION greets the listener with a striking sky image on the cover before unleashing a dozen original tracks in a mature transition from artist to listener. Perhaps by design, not an album for genre purists, but definitely one for those possessing an open ear. For descriptive purposes, take this record as a fringed-pop piece of adult contemporary rock, moulded into a package that would appeal to fans exploring the outer edges of folk, country and Americana. Where the record does score high is on the plentiful supply of chorus friendly melodies, occasionally heading into anthem territory, but never coming across as trend-chasing efforts. Willie’s experience working with Craig Wiseman in a Nashville song-writing role around a decade ago is certainly evident in the standard of song construction. The superior level of Music City song writing is indisputable in its ability to meet the needs of different markets and its imprint is found on these songs. This album’s strength is that most of the tracks could be singled out as the focal point, but for me the two strongest are the superb and engaging opener ‘Mary Rest Your Head’ and the character-led high tensile metaphorical ballad ‘Winter Late in Spring’. The latter ends on a subtle twist and indicates a depth to the writing. Throughout the duration of the record, which gets close to the hour mark, the fullness of the band sound makes a significant mark. An organ/sax input adds spice to ‘Going Through the Motions’, while the cello gives a sombre folk feel to ‘Circles’. If you want a connotation for these two tracks settle on The E Street Band meets Blue Rose Code. In other words, contemporary working class America with a classic Scottish twist. While Willie takes control on a majority of the vocals, he does stand aside for Fiona McLeod to adopt the lead on ‘Toxic & Sweet’. The feel of this track raised comparisons with Bob Collum and the Welfare Mothers, who made a similarly excellent album a couple of years ago. There is a slight switch in the overall tempo in a couple of tracks towards the end of the album especially in ‘What We Are Now’. Interestingly, the key feature of this nostalgia-inspired song is the line ‘mortality hit me at 30’. Oh for the thought! Critically, this is an album free of formula, despite coming across as an easy ear friendly listen. It succeeds in drawing in those who make an enquiry into its worth and prospers by holding their attention. One possible amendment could have been slicing ten to fifteen minutes off the listening time and thus making the quality ultra-focussed. To Willie’s credit, I would not know where to make the cut. While this album falls into the sizeable category of acclaimed Scottish singer-songwriters, to name Justin Currie, Roddy Frame and Ross Wilson to get the list underway, it is packed with credentials to spread far from the domain of its homeland. NEW CLOUDS IN MOTION does not indulge in a populist chase, but with the prevailing winds of good fortune, it will resonate with many people who it comes into contact with. Whatever your prior experience of Willie Campbell and The Open Day Rotation, the songs enrich the listener and make this a late candidate when considering releases that have made a significant effect in 2017.